Illustration of the pterosaur quadrupedal launch. Appeared in Popular Science, credited to Kevin Hand (3 March 2009). This is the first of a series of blog posts from students' course work for the "Bio-aerial Locomotion" class at GW's Mechanical and Aerospace Engineering Department. The students explore several controversial topics about a giant pterosaur's ability to fly. On Sept. 22, 2013, Prof. Michael Habib (who was a guest speaker in our "Bio-aerial Locomotion" class a few weeks ago), posted on Google+ a seemingly innocuous note about there being "quite a few pterosaur workers at SVPCA this year." A commenter quickly dropped in to start a discussion about Habib's quadrupedal-launch thesis for how pterosaurs took off. Even the first comment was somewhat cynical with a suggestion that "the poor creature fell flat on its face." What ensued was an amusing argument about all things pterosaur. Quadrupedal launch — How does this work? What is the evidence? How do wing extension at the end of the jump and wing tensioning work? 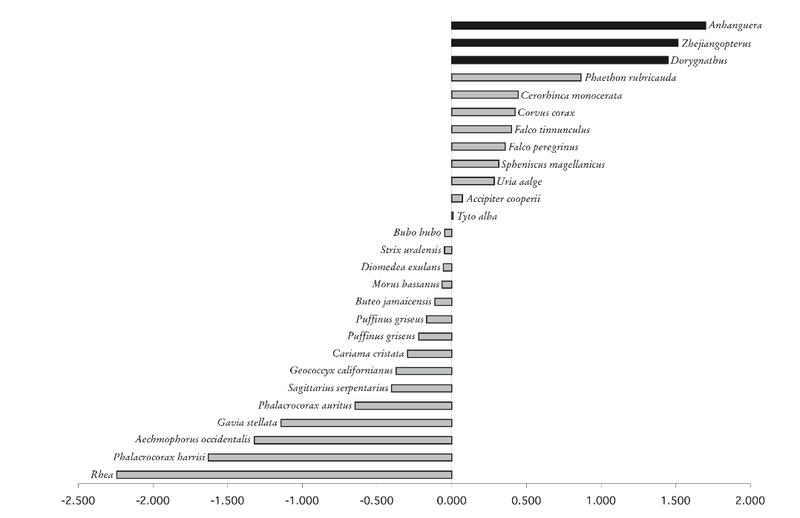 Weight estimation for pterosaurs — How do the various weight estimates work out? Were their bones hollow? How much did the skeleton weigh? Is there value to "reverse mass estimation," as done by Cunningham? How does this match with the other estimates of pterosaur weight? Wagner effect — What's this? Does it apply only to insect flight, or to any impulsively started airfoil, as Habib defends? How important is it at different ranges of sizes? Pterosaur wing extension — What was the shape of their wings? How did they manage the upstroke? Speed, range, altitude —Claims that Q. northropi could fly up to 80 mph for 7–10 days at altitudes of 15,000 feet, for ranges of over 8,000 miles. How is this justified? After researching each question in groups of two or three, the students wrote a summary of their findings, which they continued to work on outside of class during the week. After slight editing, I've combined their write-ups into "Student guest blog posts" for your enjoyment. Pterosaur flight is of special interest to both paleontologists and aerodynamicists because it might represent a unique form of natural flight, very different to that of other flyers. The size and flight characteristics of pterosaurs have received considerable research interest for the last century but suffer from confusing interpretations of pterosaur biology and flight characteristics. Researchers have often argued about the aerodynamic characteristics of these animals, specifically if and how they can be analyzed using avian bio-mechanics. Due to considerable differences between avian and pterosaur anatomy, avian parameters, when (incorrectly) applied to pterosaurs, yield interpretations of pterosaur flight that are problematic. The assumption of bird-like flight has led to assertions that giant pterosaurs were extremely lightweight to facilitate flight or, if more realistic masses are assumed, could not fly. Recent research into scaling and morphing of pterosaur fossils shows that bird and pterosaur wing structure, humeri and femuri bending strength and launch kinematics are just too different. Thus, according to these findings, many previous conclusions that assumed mechanical similarity with birds, e.g., that giant pterosaurs were flightless, were based on inaccurate and poorly supported data. How did pterosaurs take off? Of particular interest in pterosaur flight is the launch. Pterosaurs were large and had significant weight, both a disadvantage when trying to get airborne. The conventional bipedal launch, as used by birds, is problematic for the pterosaur. Its hind limbs were not strong enough to provide the forces required for takeoff. Some researchers, such as Dr. Sankar Chatterjee, present takeoff scenarios assuming a bipedal launch, but require strange conditions, such as running downhill into the wind (also difficult with weak rear limbs), takeoff from cliffs, or hanging inverted from trees and releasing to gain the speed required for flight. Recent research conducted by Dr. Michael Habib (and colleagues) explains the kinematics of a quadrupedal launch, in which the pterosaur would use both its fore and hind limbs to “vault” from the ground. The large ratio between the bending strength of the fore and hind limbs suggests that the forelimbs were able to carry large loads, as would be needed in quadrupedal launch. Dr. Habib provides convincing data and evidence to support the possibility of a quadrupedal launch and goes on to explain why quadrupedal take-off should be seriously considered in future research. Pterosaur Skeleton in “vaulting” position. Image from “On the Size and Flight Diversity of Giant Pterosaurs, the Use of Birds as Pterosaur Analogues and Comments on Pterosaur Flightlessness”, Witton and Habib, PLOS One (2010). Of interest for comparison is the vampire bat: an existing creature today with similarly weak hind limbs, which executes a quadrupedal launch. This video of a vampire bat running on a small treadmill illustrates a possible form of locomotion on the ground with patagium-equipped strong fore limbs. Comparing a quadrupedal launch to a bipedal launch, one can identify that the former is dominated by the power from forelimb and pectoral musculature, whereas the latter is dominated by hindlimbs during take off. Thus, if the quadrupedal hypothesis is correct, the bending strength of humeri (bone in the forelimb) must have been larger than that of a femuri (bone in the hindlimb) for a pterosaur. Dr Habib supports this hypothesis with appropriate data. Strength ratios of humerus to femur for birds and pterosaurs. Figure 2 of Habib (2008), Zitteliana B28. The graph above compares the log of the ratio of humeri to femuri bending strengths for different birds and flying reptiles. Notice that for many birds the values are negative: the ratio of humeri to femuri strength is less than unity, implying that the bending strength of the hindlimbs is greater than that of the forelimbs, a characteristic common in bipedal launchers. If we examine the extremes of the graph, we find on one end birds such as the rhea and phalacrocorax harrisi, which are flightless but are very strong runners. Aechmophorus occidentalis, or the western grebe, demonstrates the strength of its femuri by performing a ritual called “weed dance” in which they rush through the water as if walking on it. On the other extreme of humeral to femoral strength, we find some high-speed flyers, especially divers, and some swimming birds, such as penguins. Both of these types of animals need high wing strength, either to pull out of steep dives, or to exert and withstand the larger forces necessary for swimming and diving into water. Bending strength of major bones in several pterosaurs. Table 2 of Witton & Habib (2010). The table above displays, among other things, the relative failure force of certain pterosaur bones and the avian expectation, by which we mean the expected failure force were avian bones scaled to the same size as the pterosaur bones. Of interest is the fact that for pterosaur humeri, the observed failure force is about 2.5 times greater than the scaled expectation, while the femur presented above is about one third the expected strength. Again, we see that the pterosaurs had significantly weaker hind limbs than the birds of today, suggesting that bipedal launch would have been impossible for them. Examining the fossils and the excavation sites, scientists found that pterosaurs walked on four legs. Footprints found on a beach in France start abruptly, with the deepest footprints at the start of the track. The tracks are interpreted as a landing site for a pterosaur (Mazin et al., 2009). This supports the claim that pterosaurs, though large and heavy, did fly. A thesis submitted by Julia Molnar in March 2009 (Johns Hopkins University) explains how the actual quadrupedal launch could have worked. She used Dr. Habib’s kinematic model, which specifies the timing and duration of each phase of the launch sequence. According to the thesis report, a quadrupedal launch is divided into four stages: Stance, Crouch, Vault and Launch. Stance —This was the primary phase for a launch: the pterosaur positioned itself and took the required stance for its launch. Crouch —During the Crouch phase, the pterosaur’s center of gravity was closest to the ground than in any other phase and its limbs were deeply flexed. The spine was flexed slightly and the shoulders were rotated to bring the hind limbs into deep flexion. Vault —The pterosaur then positioned itself for the ballistic launch. The centre of gravity described an arc of 1.18 meters in .32 seconds. Launch —In the final phase, the pterosaur completed its quadrupedal launch and took off. Based on the findings and the fossils, Dr.Habib created a model to study the launch. The wingspan of the model was kept at 5 meters, based on the data available after careful study of the fossils. The kinematic model predicts that an aerodynamically optimal launch of a pterosaur with a 5-meter wingspan would have a velocity of 12.68 meters per second and a launch angle of 30°. Julia Molnar reconstructed the pterosaur's parabolic path during its launch. Experiments conducted on this model specified the maximum height a pterosaur can reach following a parabolic path (1.7 m) as the clearance required by a pterosaur for its first flight stroke. Using the data presented by Dr. Habib and an estimated pterosaur body mass of 250 kg, some rough calculations yield the following results. A pterosaur would need to exert a force of about 5 kN over the 0.63-second vault and launch phases to reach the required speed for launch, which seems reasonable for an animal of such size and strength. For comparison, this is about the average force a professional soccer player exerts on a kicked ball, or about half the maximum force generated by a human weightlifter. From all of the data that we have examined, we are reasonably convinced by the conclusion that large pterosaurs were unlikely to be bipedal launchers, and, indeed, the quadrupedal launch seems quite plausible. Koo-Geun Hwang, Min Huh, Martin G. Lockley David M. Unwin & Joanna L wright. “New pterosaur tracks (Pteraichnidae) from the Late Cretaceous Uhangri Formation, southwestern Korea” Geological Magazine, Cambridge Journals. doi: 10.1017/S0016756802006647. Julia Molnar, “How giant reptiles flew: Visualizing Quadrupedal Launch in Pterosaurs”, thesis submitted to Johns Hopkins University, March, 2009. Mark Witton and Michael B. Habib. "On the Size and Flight Diversity of Giant Pterosaurs, the Use of Birds as Pterosaur Analogues and Comments on Pterosaur Flightlessness" PLOS One (2010) doi: 10.1371/journal.pone.0013982. Good stuff everyone! I liked the comparisons with athletics at the end (provides good reference points for non-specialists). An additional issue that might be worth discussing in class, which I haven't brought up yet in the formal literature is the issue of maximum angle of attack. Most pterosaurs could probably balance in a bipedal posture, if desired, but this puts them in a very erect stance that makes the angle of attack of the wings extremely steep. Placing the wings at a more reasonable angle of attack forces pterosaurs into a more horizontal posture, which isn't balanced - unless they stay quadrupedal (which, of course, the trackways show they did). I'm glad you enjoyed it! I really like your point about the angle of attack, here. With the patagium attached from the forelimb to the hindlimb, a pterosaur would be less able to rotate its wings at the shoulder to adjust its angle of attack, especially when grounded, correct? 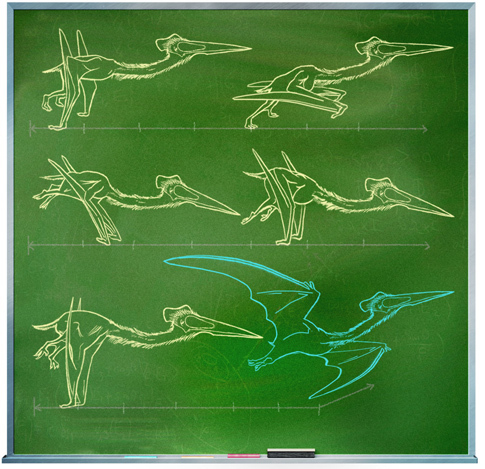 Would you expect most change in pterosaur angle of attack, then, is created by differential limb movements, that is to say, moving the legs up or down relative to the wings? Thanks Alex. The wing would still be able to rotate at the shoulder to adjust angle of attack, but the hind limbs would have to take up any slack created by the rotation to prevent flutter. They would not be able to do so during a bipedal launch, and this would create complications as you surmised. Effective angle of attack could also be increased by slightly depressing the hind limbs in flight, thereby increasing inboard wing camber, as you suggest. A combination of camber control and shoulder rotation were probably the primary methods of adjusting in-flight angle of attack. However, twist in the outboard wing relative to the inboard wing was also possible, and this could be used to adjust the degree of wash-out and help provide aeroelastic stability. Dr Habib, I have a question. How much coefficient of lift do you think was generated by pterosaurs during take- off and landing ? And has anyone carried out aerodynamic analysis of its wing shape ? Jim Cunningham predicted a maximum lift coefficient of 2.0-2.2 back in the late 1990's for large pterosaurs. Colin Palmer has done experimental work on synthetic wings shaped and built like pterosaur wings, and measured a maximum lift coefficient of 2.2, in line with Jim's expectations (Note that this is quite a bit higher than what avian wings can manage. Birds max out around 1.6-1.8 for quasi-steady scenarios). Smaller pterosaurs, such as anurognathids, may have been able to generate much higher lift coefficients during tight maneuvers, landing, or immediately after/during launch. Unsteady lift coefficients in living bats and birds can exceed 4.0 (see work by Norberg). I expect that anurognathids could have done the same, based on the anatomy of their shoulder and wrist. However, this hypothesis awaits experimental validation. Wow....so, a soccer player could kick a 250-lb pterosaur off of the ground and into flight?